Disposing of sensitive documents in a completely secure, easy, cost-effective and environmentally responsible manner should be a priority for every business. 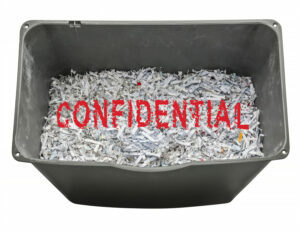 Using a document-shredding service makes all this easy. Here’s a simple checklist to help you find the right service for your needs. With the rise of identity theft, corporate fraud, industrial espionage and other threats, having sensitive data fall into the wrong hands can be disastrous. Through the entire process of handling and destroying your sensitive documents, security is our top priority, giving you complete peace of mind. We provide locked bins for secure on-site storage of documents. Full bins are securely transported to our destruction facility. All our destruction facilities are “approved sites” — this means they have strict guidelines on product handling document disposal. We have comprehensive policies and procedures for the storage, transportation and destruction of all documents. All of our staff handling document destruction are cleared to a minimum of a National Police Records Check. Our entire process and all facilities are in full compliance with government regulations. We take the hassle out of secure document destruction. Our locked bins are delivered to your premises, then collected by our security-checked personnel, providing you with a simple, headache-free process. Every business has its own needs, so the service you choose should be scalable to match your document-shredding requirements. We have a minimum order of two bins (for a maximum of two weeks), but if your requirements exceed this capacity we can scale up your order to match. You don’t have to keep the bins for the entire two weeks — when you’re ready for a pickup, just call. You can even load the bins as soon as we deliver, and away they go! With our secure document-shredding service there’s no need for you or your employees to waste valuable time disposing of sensitive documents, allowing you to be more productive where it counts. With concern for the environment on the rise among both individuals and businesses, it’s important to minimise your ecological footprint. All recyclable documents we handle are reduced to tiny fragments through a comprehensive cross-shredding process, then transported securely to a recycling plant to be transformed into recycled products. Contact Metropolitan Shredding Service today on 1300 677 074 to find out just how easy it is to enjoy the many benefits of secure document shredding.